An IT industry analyst article published by SearchDataManagement. The speedy evolution of big data technologies is connected to five trends, including practical applications of machine learning and cheap, abundantly available compute resources. I’ve long said that all data will eventually become big data, and big data platforms will evolve into our next-generation data processing platform. We have reached a point in big data evolution where it is now mainstream, and if your organization is not neck-deep in figuring out how to implement big data technologies, you might be running out of time. 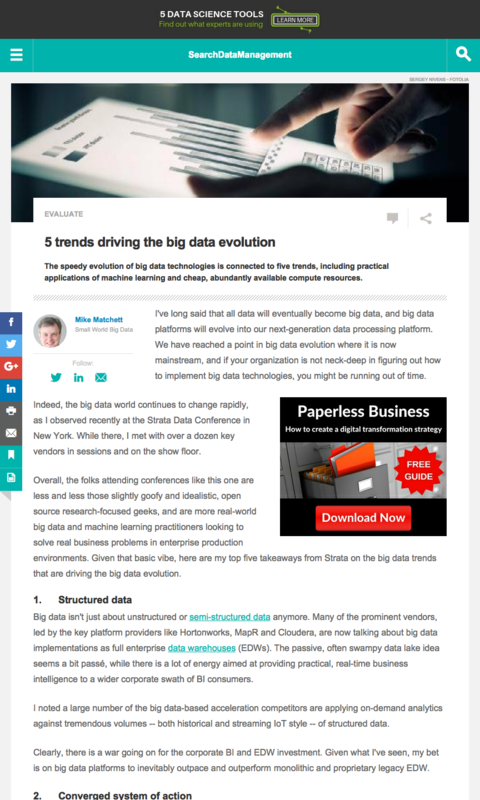 Indeed, the big data world continues to change rapidly, as I observed recently at the Strata Data Conference in New York. While there, I met with over a dozen key vendors in sessions and on the show floor. Overall, the folks attending conferences like this one are less and less those slightly goofy and idealistic, open source research-focused geeks, and are more real-world big data and machine learning practitioners looking to solve real business problems in enterprise production environments. Given that basic vibe, here are my top five takeaways from Strata on the big data trends that are driving the big data evolution. Big data isn’t just about unstructured or semi-structured data anymore. Many of the prominent vendors, led by the key platform providers like Hortonworks, MapR and Cloudera, are now talking about big data implementations as full enterprise data warehouses (EDWs). The passive, often swampy data lake idea seems a bit passé, while there is a lot of energy aimed at providing practical, real-time business intelligence to a wider corporate swath of BI consumers. I noted a large number of the big data-based acceleration competitors are applying on-demand analytics against tremendous volumes — both historical and streaming IoT style — of structured data. Clearly, there is a war going on for the corporate BI and EDW investment. Given what I’ve seen, my bet is on big data platforms to inevitably outpace and outperform monolithic and proprietary legacy EDW. This leads into the observation that big data evolution includes implementations that host more and more of a company’s entire data footprint — structured and unstructured data together. Some organizations take their time with new technologies to let first adopters suffer the growing pains. But there’s no treading water in the big data stream; the current won’t wait. Have you noticed yet? Those geeky big data platforms based on clusters of commodity nodes running open source parallel processing algorithms are evolving into some seriously advanced IT functionality. The popular branded distributions of the Apache projects, including Hortonworks, Cloudera and MapR, are no longer simply made up of relatively basic big data batch query tools, such as Hadoop MapReduce, the way they were 10 years ago. We’ve seen advances in machine learning, SQL-based transaction support, in-memory acceleration, interactive query performance, streaming data handling, enterprise IT data governance, protection and security. And even container services, scheduling and management are on a new level. Big data platforms now present a compelling vision for the future of perhaps all IT data processing. Wait — do I really mean all IT data center processing will be big data processing? Most of us are just getting used to the idea of investing in and building out functional data lakes to capture and collect tons of unstructured data for business intelligence tasks, offline machine learning, active archive and other secondary data applications. And many are having a hard time making those data lake initiatives successful. It’s a challenge to develop staff expertise, assure data provenance, manage metadata and master implied schemas, i.e., creating a single version of truth. 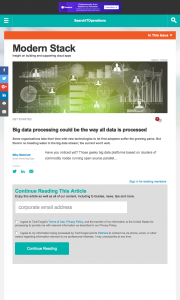 Many organizations may be waiting for things in the big data market to settle out. Unfortunately, especially for those more comfortable being late adopters, big data processing technology development is accelerating. We see use cases rapidly proliferate, and general IT manageability of big data streams (easing adoption and integration) greatly increase. The universal big data onslaught is not going to slow down, nor will it wait for slackers to catch up. And those able to harness their big data streams today aren’t just using them to look up old baseball stats. They are able to use data to improve and accelerate operations, gain greater competitiveness and achieve actual ROI. I’m not even going to point out the possibility that savvy big data processing will uncover new revenue opportunities and business models. Oops, just did! If you think you are falling behind today on big data initiatives, I’d recommend you consider doubling down now. This area is moving way too fast to jump on board later and still expect to catch competitors. Big data is proving to be a huge game changer. There simply won’t be a later with big data. I’ve written before that all data is eventually going to be big data. I’ll now add that all processing is eventually going to be big data processing. In my view, the focus of big data technology has moved from building out systems of insight over trailing big data sets to now offering ways to build convergent systems of action over all data. 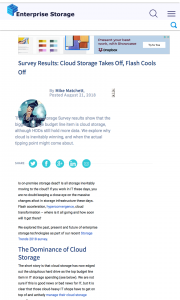 An IT industry analyst article published by Enterprise Storage Forum. 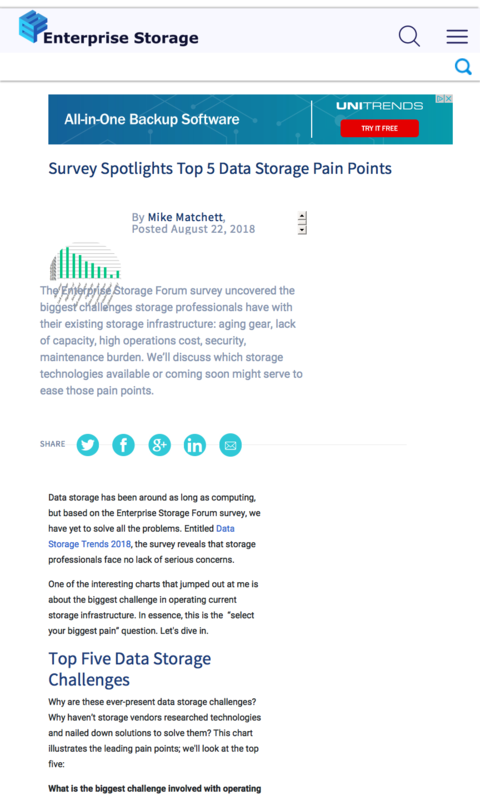 The Enterprise Storage Forum survey uncovered the biggest challenges storage professionals have with their existing storage infrastructure: aging gear, lack of capacity, high operations cost, security, maintenance burden. We’ll discuss which storage technologies available or coming soon might serve to ease those pain points. Data storage has been around as long as computing, but based on the Enterprise Storage Forum survey, we have yet to solve all the problems. Entitled Data Storage Trends 2018, the survey reveals that storage professionals face no lack of serious concerns. One of the interesting charts that jumped out at me is about the biggest challenge in operating current storage infrastructure. In essence, this is the “select your biggest pain” question. Let’s dive in. Still, once something like storage is deployed, the capex is a sunk cost. Aging storage should probably be replaced long before full obsolescence comes along; significant attribute improvements are likely available on the market at any large storage’s “half-life.” These include better performance and agility, cheaper operating costs and upgrades, increased capacity and new features. Here, I can’t blame storage vendors for lack of improved storage offerings. From flash engineered designs to software-defined agility, the storage landscape is full of opportunistic (and large ROI) “refresh” solutions. Proactive storage managers might think to replace their storage “ahead of time” as the scales tip in favor of new solutions, rather than sit back and wait for the traditional “five year” accounting-based storage refresh cycle. 2. Lack of Storage Capacity: Yes, data is still growing. In fact, data growth can be non-linear, which makes it hard to plan ahead. Unable to keep up with capacity demand, many organizations now rely on that elastic storage provider, cloud, hybrid cloud or even multi-cloud storage services – which can get pricey! The Enterprise Storage Survey results show that the biggest storage budget line item is cloud storage, although HDDs still hold more data. We explore why cloud is inevitably winning, and when the actual tipping point might come about. Is on-premise storage dead? Is all storage inevitably moving to the cloud? If you work in IT these days, you are no doubt keeping a close eye on the massive changes afoot in storage infrastructure these days. Flash acceleration, hyperconvergence, cloud transformation – where is it all going and how soon will it get there? We explored the past, present and future of enterprise storage technologies as part of our recent Storage Trends 2018 survey. The short story is that cloud storage has now edged out the ubiquitous hard drive as the top budget line item in IT storage spending (see below). We are not sure if this is good news or bad news for IT, but it is clear that those cloud-heavy IT shops have to get on top of and actively manage their cloud storage spending. Despite having cloud move into the lead for slightly more than 21% of companies, the game is not over yet for on-premise storage solutions. Flash has still not run it’s full course and HDDs are still the top budget item today for almost as many companies (21%) as cloud. An IT industry analyst article published by Search Converged Infrastructure. 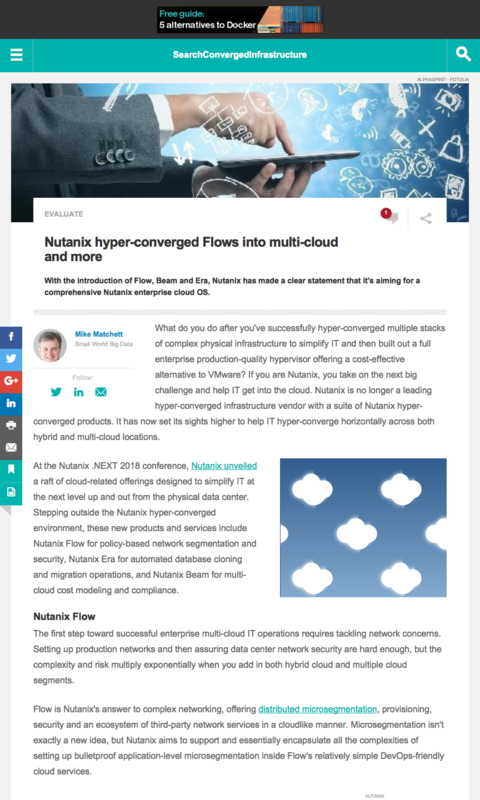 With the introduction of Flow, Beam and Era, Nutanix has made a clear statement that it’s aiming for a comprehensive Nutanix enterprise cloud OS. What do you do after you’ve successfully hyper-converged multiple stacks of complex physical infrastructure to simplify IT and then built out a full enterprise production-quality hypervisor offering a cost-effective alternative to VMware? If you are Nutanix, you take on the next big challenge and help IT get into the cloud. 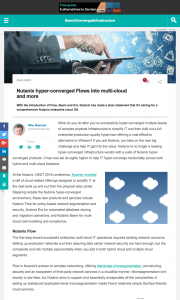 Nutanix is no longer a leading hyper-converged infrastructure vendor with a suite of Nutanix hyper-converged products. It has now set its sights higher to help IT hyper-converge horizontally across both hybrid and multi-cloud locations. At the Nutanix .NEXT 2018 conference, Nutanix unveiled a raft of cloud-related offerings designed to simplify IT at the next level up and out from the physical data center. Stepping outside the Nutanix hyper-converged environment, these new products and services include Nutanix Flow for policy-based network segmentation and security, Nutanix Era for automated database cloning and migration operations, and Nutanix Beam for multi-cloud cost modeling and compliance. The first step toward successful enterprise multi-cloud IT operations requires tackling network concerns. Setting up production networks and then assuring data center network security are hard enough, but the complexity and risk multiply exponentially when you add in both hybrid cloud and multiple cloud segments.